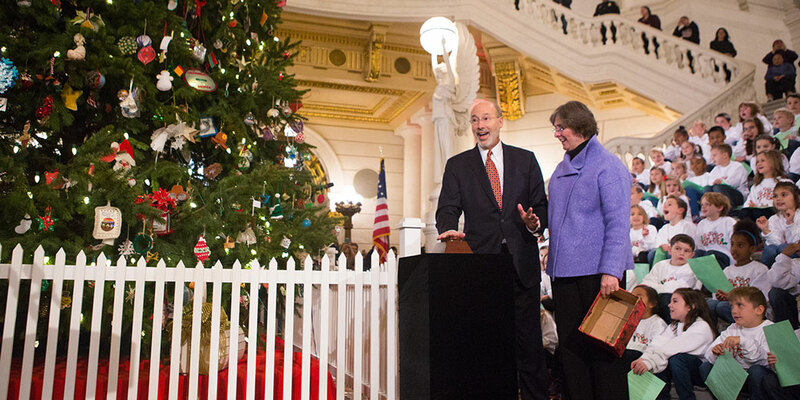 Harrisburg, PA – Governor Tom Wolf and First Lady Frances Wolf are inviting the public to join them for the 2018 Capitol Christmas Tree Lighting ceremony at noon Thursday, December 6, in the Rotunda of the Main Capitol Building in Harrisburg. The Governor and First Lady will be joined by Pennsylvania Department of General Services Secretary Curt Topper and the Rev. Dr. Amy Doyle Welin, Acting Dean of the Episcopal Cathedral of St. Stephen in Harrisburg. The Quakertown High School Varsity Singers will perform, and Santa Claus will make an appearance. The Governor will deliver a special holiday message and lead the audience for the countdown to light the Capitol Christmas Tree. This event is open to the public for those wishing to attend.